Moving from selling goods to Product Service Systems (PSS) will promote coupling of environmental objectives with economic growth. However many difficulties hinder their implementation. Companies must rethink business models and replace value of exchange by value in use, involving long term relations. 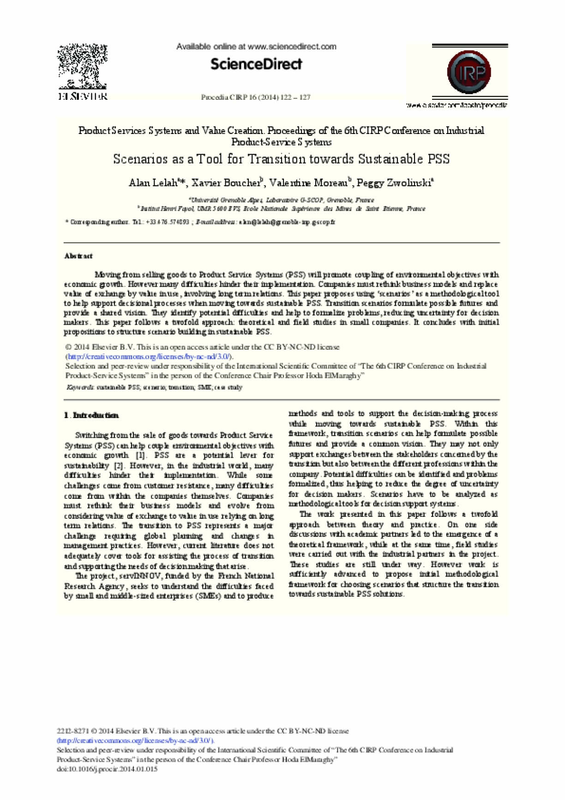 This paper proposes using 'scenarios' as a methodological tool to help support decisional processes when moving towards sustainable PSS. Transition scenarios formulate possible futures and provide a shared vision. They identify potential difficulties and help to formalize problems, reducing uncertainty for decision makers. This paper follows a twofold approach: theoretical and field studies in small companies. It concludes with initial propositions to structure scenario building in sustainable PSS.